President Barack Obama's new plan for NASA has been met withsome anger and confusion in the weeks since its announcement, drawing sharp objectionsfrom critics who view it as a radical vision change for the space agency that wouldupset the world leadership of the United States in space. But similar shifts have occurred throughout NASA?s more than50-year history, and some space experts counter that this new plan — whichwould use commercialspacecraft to fly astronauts in space instead of government spacecraft — isno more radical than those previous changes. The newspace plan calls for the cancellation of the existing Constellationprogram, which has been overseeing the construction of new Ares I and Ares Vrockets to take humans to low-Earth orbit and back to the moon. Instead, theObama administration aims to encourage private industry to develop commercialspacecraft to ferry humans to and from the International Space Station, whileNASA focuses on research and development to enable future space exploration. "Of course it's happened in the past," said RogerLaunius, space history curator at the Smithsonian's National Air and SpaceMuseum. "Of course programs have been canceled — they?ve been canceled inmid-stream." For example, he said, some of the hardware to fly the Apollo18, 19 and 20 missions had already been built when President Nixon cancelledthe Apollo program in the 1970s. Similarly, Skylab, the United States' first space station,was meant to be followed up by a sibling station called Skylab B, but thatprogram was also canceled in the 1970s. In a hearing last week held by members of a House Scienceand Technology Committee reviewing President Obama's 2011 NASA budget request,Senator David Vitter (R-Louisiana) called the proposal a "radicaldeparture from all previous NASA plans under any administration." The budget request received vocal opposition from U.S.senators and House representatives during a series of review hearings lastweek. Congressman Bart Gordon (R-Tennessee), chairman of the House Science andTechnology Committee also called the new plan a "radical change" for NASA. In the $19 billion budget request submitted by PresidentObama, NASA would receive a slight boost in funding for 2011. It calls for thecancellation of NASA?s space shuttle fleet at the end of this year as planned,but would extend the International Space Station?s lifetime by five years to atleast 2020. Without the shuttle, and the Constellation program shelved,NASA will be reliant on Russia?s Soyuz spacecraft to fly Americans to the spacestation until commercially built spacecraft are available for ferry flights inthe United States. The gap is expected to take several years. It is that shift which lawmakers have found hard to stomach. "It cancels all major existing human spaceflightprograms . . . and replaces all that with little more than a hope and a prayer thatcommercial providers will eventually pick up the slack," Vitter said. NASA administrator CharlesBolden, who was also at the hearing, countered that the Constellationprogram was unsustainable at its current funding level, and that the newproposal isn't as different as it sounds. "This is not a radical departure from anything, it'sjust a departure from the way we were trying to get there," he said. In fact, NASA has also faced gaps in access to space forAmerican astronauts before. The largest spanned six years as NASA shifted fromcapsule-based spacecraft to winged and reusable space shuttles. After the last Apollo spacecraft flew in 1975 to link upwith a Soviet Soyuz in the Apollo-Soyuz Test Project, American astronauts didnot fly in space until April 12, 1981. That was when NASA?s first space shuttleColumbia blasted off with two astronauts aboard on its first orbital testflight. In 1986, the tragic loss of shuttle Challenger and sevenastronauts prompted a two-year hiatus in shuttle flight until safetyimprovements could be made. NASA also stood down for two years after the 2003Columbia accident as well. Fears about the new program also stem from the increasedemphasis on commercially built vehicles. But this concept, too, isn't exactlynew. 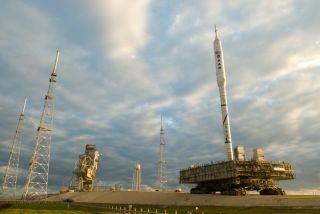 "There's been an expectation for many years that theprivate sector would become more involved," Launius told SPACE.com. "There'sbeen efforts across the history of the agency where there's been various piecesof it they tried to make more private." Before the Challenger space shuttle accident, there had beensome discussions between NASA and some commercial airline companies aboutpotentially selling the space shuttle fleet, Launius said. The shuttles wouldthen have become private vehicles that NASA would have contracted with to providerides for astronauts to space. Those plans were derailed by both the loss of sevenastronauts on Challenger, which exploded and broke apart just after liftoff onJan. 28, 1986, and worries by the companies that the deal wouldn't be profitableenough. But while there have been intimations of increasedprivatization of space, this plan would still represent a new frontier, otherexperts say. "['Radical'] might be a little bit dramatic, but it'scertainly a big shift," said Leroy Chiao, former NASA astronaut and a memberof the blue-ribbon panel President Obama commissioned to review NASA's plansbefore designing the new proposal. "I would say it's unprecedented." He said he thought it made sense to look to commercialindustry to provide transport to low-Earth orbit, but that NASA should alsostay in the business of building spacecraft. "NASA's job should be focused on exploration, goingbeyond low-Earth orbit," he said. Even though it may be a significant change, Chiao said itmight be for the best. "Transitions are difficult but sometimes you need somekind of a dramatic change in order to get that improvement," he said. Video — What's Next For NASA?